The jewelry orgnizers (Stick hook) Includes 3pcs for Earring. That s enough for over 2000pieces of jewelry! It can stick on cabinet and wall! 3pcs for Necklace. (9pcs for the jewelry orgnizers). 3pcs for Ring. 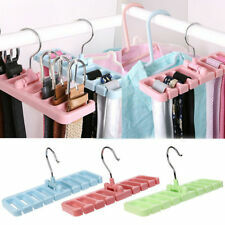 Adjustable 360° Rotating 20 Tie Belt Scarf Compact Hanger Rack Holder Organiser. 1 Tie Hanger. 360°rotating hook for more flexible plaing. Hook number: 20. Anti slide design for convenient use. With compact size but big capacity, can save place for you. 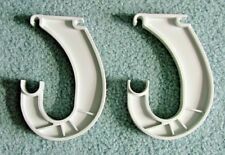 ClosetMaid Rod Bar Support Hanger J-Bracket Hooks (2) - FAST SHIPPING! Item SKU number 5629, color is white. Use to add clothes hanging space to SuperSlide Shelving. Vintage Wood Tie Rack Hook Wall Mount. Pre owned. Shows some scuff marks (see pictures) Payment due at time of purchase Item ships within 2 business day of cleared payment Returns accepted within 30 days less shipping. Buyer pays return shipping. These accessories bring a touch of class and elegance to the kitchen, bedroom and bathroom while, simultaneously, helping to keep the rooms tidy.Order in the wardrobe: Belts, ties and scarves need to be kept neat and handy. Turn the backseat into a closet on wheels. Heavy-duty clothes bar attaches 2 ways - position end hangers in the down position to hook over grab handles, or rotate upright to hang from ceiling hooks. Besides, its large opening hook is another characteristic and suitable for most of the wardrobe hanging rods. 3 TINKSKY 360 Degree Rotating Four Claw Twirl Tie Rack Necktie Belt Scarf Hanger Organizer Holder Hook Closet Organizer. 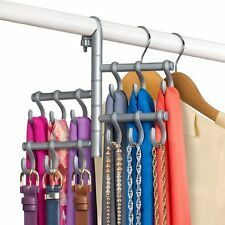 This item is a wall mount clothes rack hanger, which is made of durable aluminum, stainless steel and nylon. With adjustable arm, easy to fit for different demands, it is a great clothes rack for laundry organization and closet storage system. 1 x Under Cabinet Hook Mug (Black). The direction of the hook is more convenient to use, not only for use in the kitchen but also for ties, belts, scarves and handbags hanging in your cabinet. 1 x under cupboard cup hook (white). Heavy duty durable constructions, long lasting hooks. Open box in perfect condition. There is only 47 in the box. 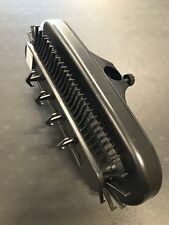 Perfect for holding tools and other accessories on your board. If your item is in fact defective, we will replace it at no extra cost to you. Umbra Estique Purse Organiser. Vine style wire organiser, from the Estique collection by Umbra, maximizes vertical closet space. With 6 hooks and specially designed rotating function, users can easily access purses, scarves, belts and accessories. Wooden knobs at end of each hook prevents delicate items from snagging or pulling. The Estique Purse Organiser measures approx. 41.9 x 12.7 x 2.5cm. Designed by Eugenie de lonyes for Umbra-original, modern, casual, functional and affordable design for the home. Space Saver closet hangers. Save up to 70% of space in your closet with 10 of these 5-in-1. Clothes, Shoes & Accessories. It is a sturdy hanging unit with five openings to hang clothing. Sound & Vision. Neatly organize and display your closet accessories. Wide application:Hang ties, belts, necktie, scarf,Bags and more. Make your wardrobe organized and tidy. Standard hanger hook fits most sizes of hanger rails and closet rods. 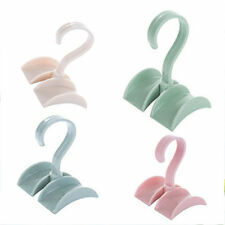 1pc Wooden Hanger Rack Hook. Can be flexible rotate 360 degrees with flexible. Tie belt Hanger, can Holds 20 ties or belts. Tie Hanger. Non-slip arms, can be hung in various places, such as kitchen and closet or anywhere, etc. 1 x Tie Hanger. Features: 1.This little Tie Rack holds and organizes 20 ties in a small space. 2.You can hang it in the wardrobe to order the ties, belts, and scarves, so that they can be taken easily 3.Strong and bendable (Not fragile) 4.Rotatable design with 360 degrees 5.A great space saver for any closet. 6.Portable with separated design. Used, but nice condition. The foam is in great shape,with nice padding. There are a few shadows of color staining as shown on one hanger. These are nice quality sturdy hangers. Material : flocking. 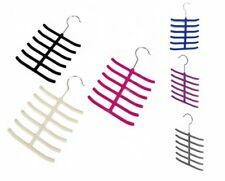 10 Pcs Clothes Hanger Hook(The BIG hanger in photo is not include). hope you could understan. There are two hooks that can be hung on the cross bar in the closet. There are five small rods below. Each small rod can hold 1-4 trousers, 5-20 trousers totally. It's easy to carry. When you travel, just roll your pants around the trousers rack and put them in the bag. 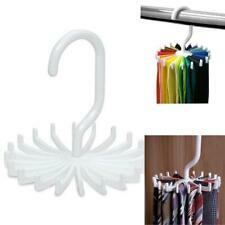 This Rotating Tie Rack is perfect to organize your favorite ties, scarves, or belts! Designed with heady duty plastic with 20 no-slip hangers, this is an item you must have for your closet. 1x Rotating Tie Rack Organizer. 1 28 Circles Scarf Rack(Color Random). Material:Steel With Rattan Weave. Clothes-Hanger design with 28 slots selections, suit your needs conveniently and perfectly. Circle quantity: 28. 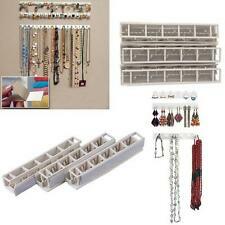 It can help you organize shawls, belts, ties and so on. Can hang over the door with hook or be attached to the wall with the provided hardware.